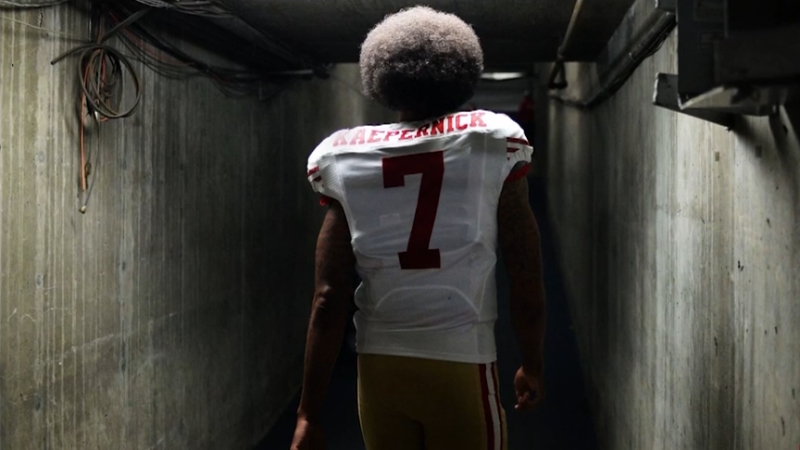 Colin Kaepernick has been championed "Citizen of the Year" by GQ. Covering the publication's December Men of the Year issue, the free agent quarterback, who placed the proverbial mirror in front of America with his protest, is honored for his ongoing movement and activism. Kaepernick was the top story in sports in 2016, when he decided to sit out the national anthem to protest the United States' refusal to address police brutality toward black men. It was after a meeting with one or more members of the military, when Kaepernick opted to kneel for the anthem instead of simply sitting on the team bench, as a way to show reverence to veterans while still sticking to his cause. GQ revealed that while Kaepernick agreed to participate in the issue as means "to reclaim the narrative of his protest," the story mainly consists of perspectives from his "closest confidants." Among these "confidants" is San Francisco 49ers linebacker Eric Reid, who joined Kaepernick in his protest last year and continued to kneel during the national anthem this season. "My goal this year has been to get the narrative back on track," Reid told the magazine. "We started having communications with the NFL, and they said they're going to help us make progress on these issues. But the next step is to get Colin back in the NFL. Because he's the one that started this. I think we're finally getting where me and Colin envision this going. Now it's time for him to get back in the league." In addition to Reid, the GQ story also features words from J. Cole, who said Kaepernick "sacrificed his dream" to stand for something, and 90-year-old activist Harry Belafonte, who said watching someone like Kaepernick take action is "the greatest reward" he could ask for. For his own comment, the subject took to Twitter and expressed being "honored" by the recognition. Kaepernick finished the 2016-2017 season with 16 touchdowns and 4 interceptions for the San Francisco 49ers, one of the best touchdown-to-interception ratios in the league. But since leaving the 49ers in the offseason, Kaepernick has not been signed by another NFL team, despite pundits having a near-consensus that he's good enough to start for some teams and to play backup for others. He filed a grievance last month against NFL owners for collusion. Colin Kaepernick says Meek Mill is "in good spirits"